Atlantic Yacht Basin’s store staff is known for their ability to find any part – whether it is in our inventory or is a special order item. We regularly stock 5,000 items in our inventory and can bring in other items on an as-needed basis. Our store is open from 7:30 a.m. to 4:00 p.m, Monday-Friday and responds to long-distance requests with a quick and courteous turnaround that is well known by those who shop with us. 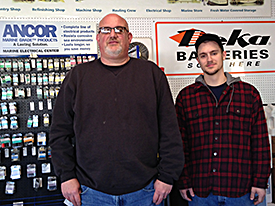 If you call in advance, you can also receive parts and materials outside of normal store hours (nights and weekends) via our dockmaster team. In addition to supplying the many projects underway on the Yard, we can provide marine supplies for local boaters looking to find that unusual part or needing advice on what brands and materials to use. For more information or to order directly, please contact us at (800) 992-2489 or (757) 482-2141 or store@atlanticyachtbasin.com. Over my 40 years of boating, I’ve dealt with many boatyards. Some were good, some were not so good. I can truly say our five year relationship with your yard was the best, and the current condition of 77 PARK attests to that.